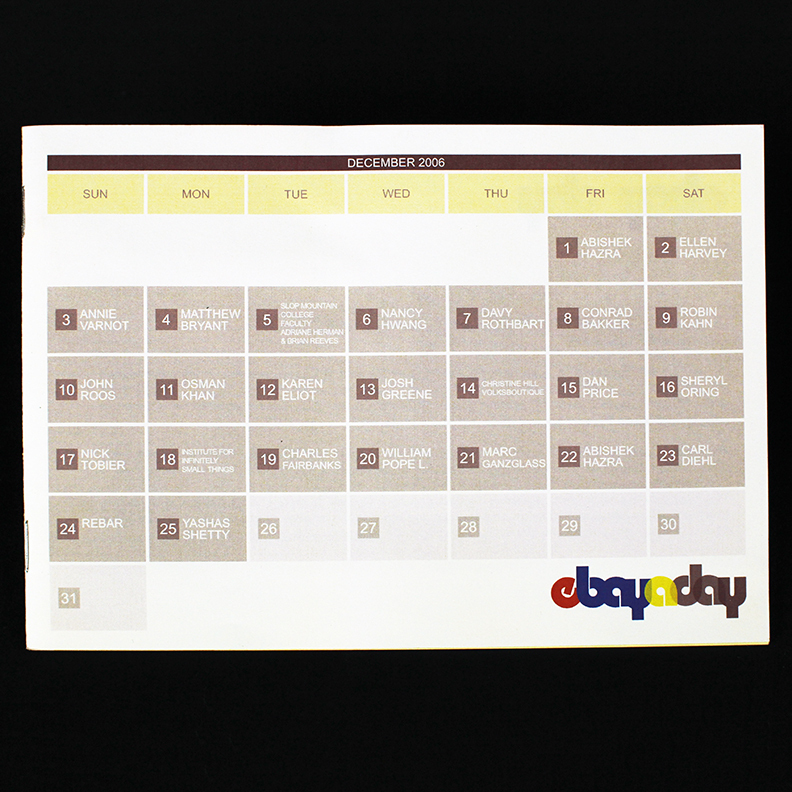 Working with designer Geoff Silverstein, we created an artist book/catalog documenting the eBayADay exhibition. 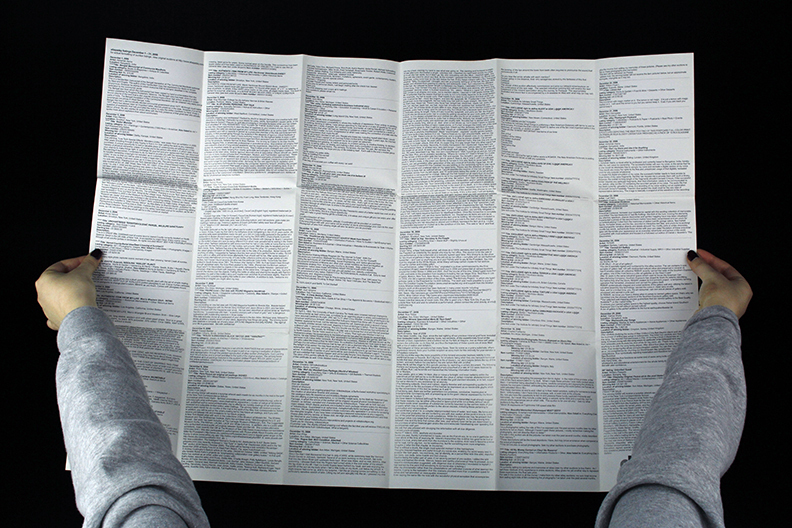 This 5×7” Fluxus-inspired mailer contained a catalog of the essays, postcards showing a screen capture of each listing, and a map of buyer/seller locations. Zack Denfeld, Aaron Ahuvia and I wrote essays contextualizing the artists’ listings within eBay and within the larger network of art’s complex relationship with commerce. The artist’s book reached a different audience than our Internet viewers as we mailed this collection to individuals and institutions with interest in engagement and the intersections of art and commerce. 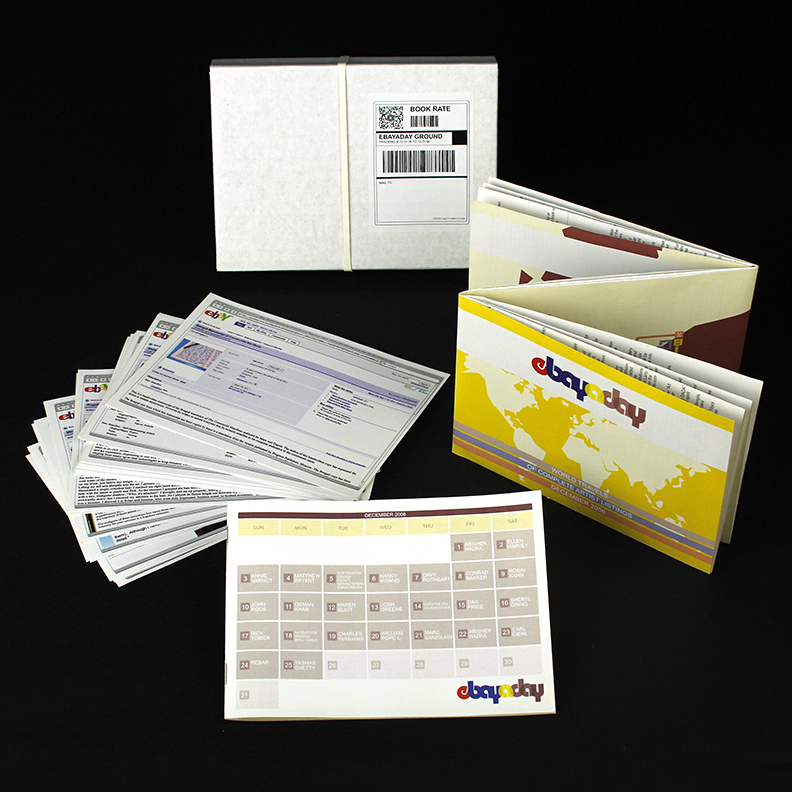 We designed each of the three parts of the catalog to underscore the actual experience of the exhibition–the calendar on the cover of the catalog book referenced the duration of the show, and the scheduled series of auctions and the 26 cards documenting each artwork so that the works could continue to circulate through mailing, and to allude to the shipments of purchased objects. 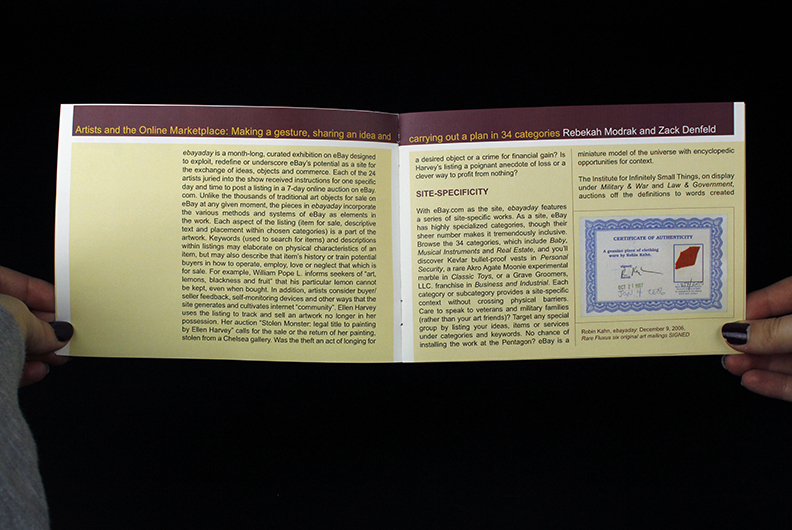 The front of each card showed a screen capture of the auction listing to introduce the online nature of the show, the original mode of navigating the exhibition. 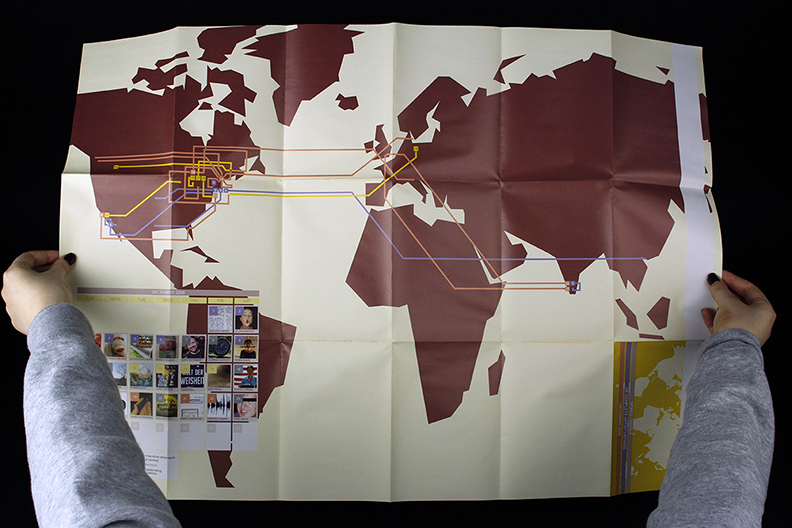 A white mailer houses all components, another nod to the role the postal system plays in the exhibition. The book also includes a map; the front of the map shows the route of artworks from seller to buyer /artist to audience, thereby revealing the geographic span of the exhibition. 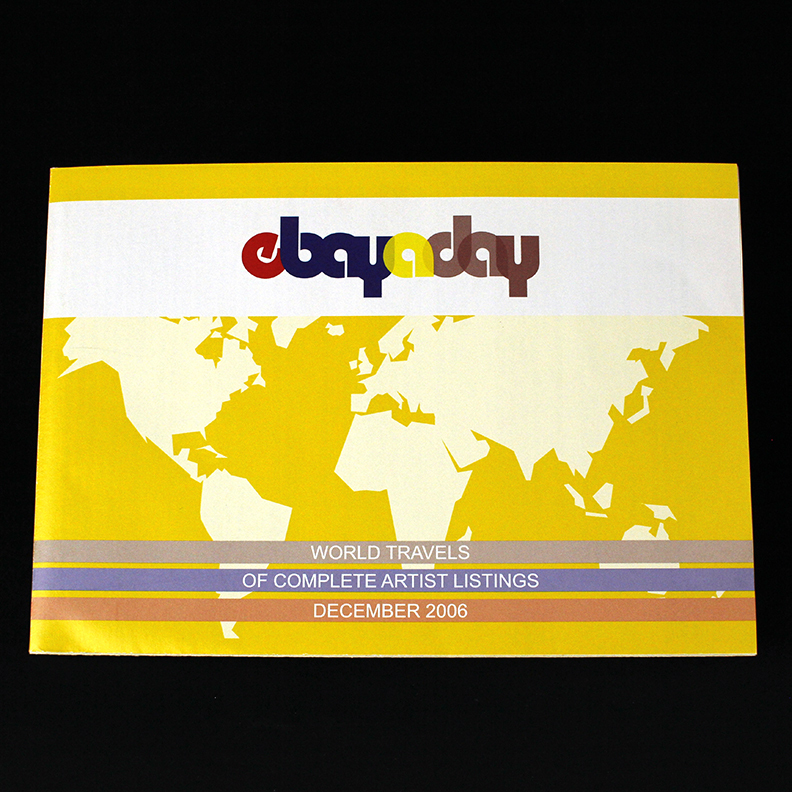 The reverse side provides full listings for each auction, including the artist’s location, listing title, category, starting bid (or winning bid, if sold), and description.